Sun, sea and culture in an oasis of green at 400m from the beach of Riviera del Conero! Lovely water sport options such as kite surfing, sailing and diving, but also horseback riding in the early morning hours on the beach. The riding school is within walking distance from the house. Including your own private spot at the beach, with 2 sun loungers and a parasol! It's not without a reason that this region is called: ´The Tuscany of times gone by´. Old places worth seeing in sloping hill landscapes. Those who appreciate the authentic atmosphere of Italy, have found the right address here. Beautiful surroundings for resting but also want to be active during the holidays. Enjoy the cuisine of The Marches at low prices. 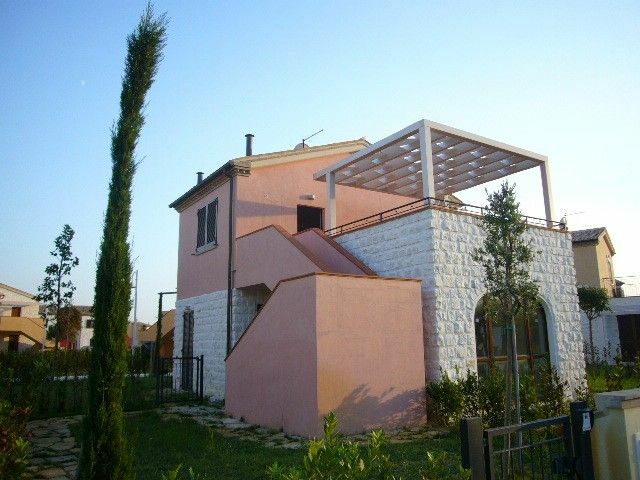 Airport with car rental at 30 min away (Ancona/Falconara) . All rooms have air conditioning, adjustable separately. Wi-Fi Internet & satellite tv (including the Dutch channels) are also available. The communal pool & tennis court w/ football will be ready in May, 2012. The 'Adam and Eve' resort is a new (2011) ten hectares large park with houses and facilities at only 300 metres away from the beach. From 19 May until 23 September, even two luxury sun loungers and a parasol at the beach are waiting for our guests! For us, the main reasons for buying this property were the beautiful green surroundings, the original colourful houses and all the different facilities at and around the resort. Very close to the beach and some excellent restaurants and at the same time, quietly situated in a green oasis. No busy road in front of your door, however, if you wish, you are right in the middle of Italian life in a few hundred metres. The typical architecture of the region of The Marches with sandstone, altered with pastel shades, give this park a special touch. Where you often would see asphalt and high fences next to your home in beach resorts in Southern Europe, here all is green and even the the parking lots are made out of natural stone! Here you will not see buildings higher than one store. The new home is situated on the first floor of a detached house. At most, you will only have downstairs neighbours. The materials used and the finishings are from the highest quality. The interior, the beds and mattresses, everything is brand new. All houses have been completed, so no more houses are being built. In the month of May 2012 the communal swimming pool will be ready, with a separate paddling pool and a tennis court and football field, only accessible to the inhabitants of the resort. There is bicycle rental, and there is a Spa with beauty centre, a bar and a Mini Market. From June 2012 the house is foreseen with its own WiFi Internet connection! The resort is safe and child-friendly. There is a 24 hour surveillance at the entrance. Only inhabitants are allowed to enter the resort by car. This guarantees a maximum of silence, security and privacy. By car from Utrecht (the Netherlands) it is a by plane from Weeze or Brussel you can fly non stop with low cost airline Ryanair to the airport of Ancona. From there, it is only a half an hour drive. Ryanair operates low-cost flights from various airports in Europe, directly to Ancona. Car rental company Hertz offers special rates for Ryanair travellers. Enjoying nature and dining out is not expensive here! We gladly give you the addresses we always like to return to. The white Verdicchio wine is marvellous, like the red Lacrima and Rosso Conero. Flights from Weeze/Germany, Charleroi/Brussels to Ancona: with Ryanair; Monday, Wednesday, Friday from 9,95 €! To Pescara on Tuesday, Thursday and Saturday. Parking of your car in Weeze: from 39 € per week. Car rental: At the airport of Ancona from 150 € per week, economic package at Hertz (lower rates in combination with Ryanair flight reservation). Distance airport - holiday home: 40 kilometres. Washing machine is available in the bathroom. From May/June 2012 the new swimming pool of 20 x 10 is ready! A separate paddling pool is being constructed, of 10 x 5 metres. Next to the pools there is a tennis court, a football field and a bar. A beauty centre and a Kids Club are being programmed. There is a golf course under construction at 400 metres from the resort. At a 10 minutes distance there is a beautiful 18 holes golf course. One can use WiFi Internet in the whole house as well as on the terrace. Also all Dutch channels can be received thanks to CanalDigitaal and seen on the LCD flatscreen television. Mehr Text kommt evtl. später. Die Ferienwohnung entsprach genau unseren Erwartungen und der Beschreibung, es hat an nichts gefehlt, einfach Ankommen und Wohlfühlen. Auch die Terrasse ist gut zu nutzen, vor allem gibt es einen Sonnenschutz. Zum Strand sind es nur wenige Meter und dort wartet ein Sonnenschirm mit zwei Liegen in erster Reihe, welche im Mietpreis enthalten sind. Einen Kritikpunkt haben wir, die viel zu enge Dusche im sonst schönen Bad, 60 x 80 cm, da kommt keine Freude auf beim Duschen, mal einen Tip an den Architekten und oder Bauherrn, die Eingangstür ins Bad hätte auch eine Nummer kleiner ausfallen können und schon hätte eine Dusche im Standardformat 80 x80 cm in das Badezimmer gepasst. Ansonsten war es ein erholsamer Urlaub mit allen Annehmlichkeiten, sehr schöne Umgebung, das Wetter italientypisch immer toll und es gibt dort wirklich keinen Massentourismus, die Region Marken ist schon ein kleiner Geheimtip. Een fijn appartement voorzien van alle comfort en een ruim terras. Natuurlijk door zijn ligging uitstekend geschikt voor een vakantie aan zee. Maar doordat de autostrada A14 op minder dan 10 minuten ligt ook een prima locatie om De Marken met al zijn schoonheid te ontdekken. De pareltjes Urbino en Ascoli Piceno zijn heel makkelijk en snel te bereiken. En bij terugkomst van een dergelijke stedentrip is het heerlijk dat er twee starndstoelen zijn gereserveerd of verkoeling te zoeken bij het prachtige zwembad van het resort. Vanaf het moment van boeken een heel plezierig contact gehad met de eigenaar die ons van veel informatie heeft voorzien. Een echte aanrader dit appartement met een prima prijs-kwaliteit verhouding. wir hatten im Juni 2015 einen wunderschönen Urlaub. Die Wohnung ist neu und zweckmäßig mit viel Stauraum ausgestatet. In der Küche findet man alles was man benötigt. Die Terasse ist groß und gut nutzbar. Einzig und allein im Bad könnte die Dusche etwas größer sein und paar Haken zum Aufhängen von Handtüchern wären von Vorteil. Die Wohnanlage ist schön und absolut ruhig gewesen. Auch stehen die einzelnen Häuser weit genug auseinander, dass eine Privatsphäre gegeben ist. Der Weg zum Strand (ca. 800m) war auch mit einem Kind gut machbar. Ausflugsziele rund um Marcelli/Numana gibt es ausreichend und sind mit dem Auto auch gut erreichbar. Der Besuch der Grotte di Frasassi war einmalig und absolut empfehlenswert. Wir würden auf jeden Fall wieder hinfahren. Sehr schöne Ferienwohnung, genau richtige Größe für eine Familie mit 2 Kindern. Die Wohnung ist ganz neu und qualitativ gut eingerichtet und die Terasse ist toll. Einziges Problemchen: die Dusche ist echt eng. Die Wohnanlage ist schön und bietet mit Pool, Kiosk und Kinderanimation guten Comfort. Der Weg zum Strand ist auch bei warmen Temperaturen gut zu Fuß zu schaffen. Zur Ferienwohnung gehören zwei Liegen mit Schirm in erster Strandlage am Kiesstrand. Insgesamt ein sehr gelungener Urlaub mit fast ausschließlich italienischen Miturlaubern. Das verlieh dem ganzen einen sehr autentischen Charakter. Zudem gab es überall sehr günstigen und leckeren Kaffee. Zum Einkaufen benötigt man allerdings ein Auto. Auch die Umgebung hat einiges an attraktiven Ausflugszielen zu bieten. Last but not least: Sehr gute Betreuung durch den Vermieter! Vielen Dank dafür. Very nice apartment, just the right size for a family with 2 children. The apartment is brand new with a good quality furnishing and the terrace is great. The only little problem: the shower is really tight. The complex is lovely with pool, kiosk and children's entertainment and offers good comfort. The path to the beach can be done by foot even in warm temperatures. The holiday home has two deck-chairs with umbrella, first row on the pebble beach. Overall a very good holiday with almost exclusively Italian holiday makers. This gave the whole experience a very authentic character. In addition, there was everywhere very cheap and delicious coffee. For shopping, you need a car. The surrounding area has some very attractive destinations. Last but not least: Very good care by the owner! Thanks for that. Villetta molto bella e ben arredata, inserita in un tranquillo villaggio di recente costruzione. Ottimo punto d'appoggio per visitare Numana, Sirolo, Recanati, Castelfidardo ecc. La spiaggia di Marcelli dista circa 1 km. ideale avere le biciclette. Very nice and well furnished cottage, set in a quiet village of recent construction. Great base for visiting Numana, Ancona, Recanati, etc. Castelfidardo. The beach is about 1 km from Marcelli. Ideal to have bicycles. The 'Adam and Eve' resort is a new (2011) ten hectares large park with houses and facilities at only 300 metres away from the beach. From the 19th of May until the 23rd of September, even two luxury sun loungers and a parasol at the beach are waiting for our guests! For us, the main reasons to buy this property were the beautiful green surroundings, the original colourful houses and all the different facilities at and around the resort. Very close to the beach and to some excellent restaurants and at the same time, quietly situated in a green oasis. No busy road in front of your door, however, if you wish, you can be right in the middle of Italian life within a few hundred metres. The typical architecture of the region of The Marches with sandstone, altered with pastel shades, give this park a special touch. Where you often would see asphalt and high fences next to your home in other beach resorts in Southern Europe, here all is green and even the the parking lots are made out of natural stone! Here you will not see buildings higher than one storey. The new home is situated on the first floor of a detached house. At most, you will only have neighbours downstairs. The materials used and the finishings are from the highest quality. The interior, the beds and mattresses, everything is brand new. All houses have been completed, so no more houses are being built. There is a communal pool with a separate paddling pool and a tennis court and football field. Also, a bar and a mini-market are present. The access to these facilities is restricted exclusively to the inhabitants of the resort. In the home and on the terrace there is an excellent Wi-Fi Internet connection. Also near the swimming pool and on the beach you can demand your free login. The resort is safe and child-friendly. There is a surveillance at the entrance. Only inhabitants are allowed to enter the resort by car. This guarantees a maximum of silence, security and privacy. By car from Utrecht (the Netherlands) it is a 1450 kilometres drive, by plane from Weeze or Brussel you can fly non stop with low cost airline Ryanair to the airport of Ancona. From there, it is only a half an hour drive. Car rental company Hertz offers special rates for Ryanair travellers. Flights from Weeze/Germany, Charleroi/Brussels to Ancona: with Ryanair; Monday, Friday from 19,95 €! Parking of your car in Weeze: from 59 € per week. Alle kosten (tax, airco/elektra/gas/water etc.) zijn in de huur inbegrepen! Alleen de eindschoonmaak kost € 50,- Van half mei t/m eind september is een eigen plek direct aan het strand met 2 luxe ligbedden en een grote parasol bij de prijs inbegrepen! Ook inclusief is de WiFi internet aansluiting, ideaal om in de schaduw op het terras te zitten.